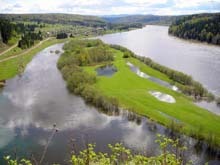 The river Vishera is considered the most beautiful river of the northern Urals - its length is 415 km and its basin covers an area of more than 31200 sq. km. Earlier it was named “Passer-Ya”, that means “Big Water” in Mansi language. Transfer to Krasnovishersk town and then to the settlement Vaya. Camp accommodation in tents. On the way: towns Neviyansk and Nizhny agil, obelisk of Europe-Asia. 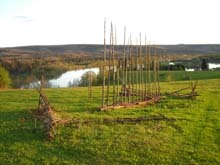 Preparation of rafts and commencement of journey. 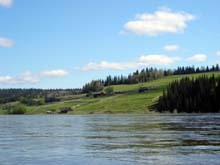 Rafting from the boundary of Visherskij State nature reserve to the island Robyshevskij. Camp accommodation in tents. Climb Mt. “Chuvalskij Kamen”. Stay the night in the tents. Rafting from the island Robyshevskij to the mouth of the river Nizhnyaya Panikha. Camp accommodation in tents. 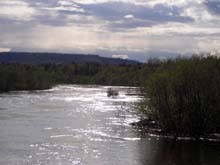 Rafting from the mouth of the river Nizhnyaya Panikha to the settlement Vels. Visit the cave Velsovskaya. Continuation of rafting from Vels to the mouth of the river “Big Rasiy”. Camp accommodation in tents. Rafting from the mouth of the river Big Rasiya to the mouth of the river Uls. Camp accommodation in tents. Rafting from the mouth of the river Uls to the island Gostinuj and then to “Fighter” rock. Camp accommodation in tents. Rafting from “Fighter” rock to the rock “Pisanui Kamen” (painted rock). Camp accommodation in tents. Excursion to the rock “Pisanui Kamen”. The rock received this name because of the numerous rock paintings in red by primitive men of the Stone Age. Figures in the rock paintings represent a lamb, a bear, a marten, a sable, a fish, and man. Near the rock there was a sacrificial place. Unfortunately, close to these rock paintings the inscriptions of modern tourists are visible everywhere. From the rock “Pisanui Kamen” we are treated to many panoramic views. There are two small caves in the close proximity of the rock. Spend the night in the tents. Rafting from the rock “Pisanui” to the settlement Sypuchi and then on to the mouth of the river “Big Schugor”. 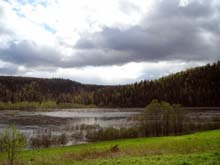 In 1950 on the left tributary of the river Vishera (Big Schugor), near the settlement Volynka in the Krasnovishersk’s district diamonds were discovered. Camp accommodation in tents. 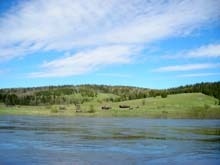 Rafting from the mouth of river Big Schugor to the settlement Visherogorsk and then on to the rock Govorlivii Kamien (“Talkative”). Govorlivii Kamien is a vertical wall of limestone rocks and has length of 2 km and a height of up to 100 metres. 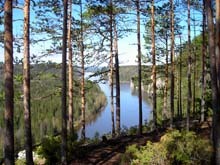 It is the most beautiful place on the river Vishera. Govorlivii Kamen is famous by its unusual echo and the many rare plants on its rocks. A great number of legends and tales are connected with this mountain. 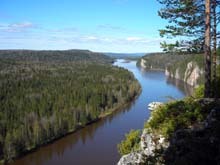 Such mountains along the river Vishera as Govorlivii Kamen are protected and a lot of care has been put into the preserving of the century long history of the people who lived here. Camp accommodation in tents. Rafting from the rock Govorlivii Kamien (“Talkative”). to the town of Krasnovishersk. 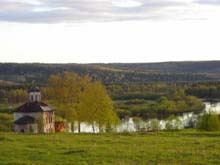 Near the town there are two mountains - “Polyudov Kamen” (Height - 527 metres) and “Kamen Vetlan”, are situated on opposite banks of the river Vishera. Polyud – was a legendary hero (“bogatyr” – in Russian), who was in love with the beautiful woman Vishera, and as a result of fighting for the love of this beauty Polyud was turned to stone on the right bank of the river Vishera and his rival, Vetlan (another legendary hero) was turned to stone on the opposite bank. At the top of Polyudov Kamen there is a television transmission tower. Climbing the mountain “Polyudov Kamen” a boundless sea of a taiga opens for us and the Ural ridge can be seen in the east. It is possible to organize an additional excursion to the mountain “Pomyanennyui Kamen“. The “Pomyanennyui Kamen” has a fantastic appearance – it is an unusual mountain. You can imagine in the rocks – stone fortresses, castles, wonderfully pierced by winds, inimitable in its beautiful fairy-tale forest landscape, which approaches the top of the mountain and forms a marvelous necklace decorating some of the ancient stone ruins. Pomyanennyui Kamen is enveloped by a strong taiga, marsh, and mosquito area – but it is also a wonderful place for nature and many berries such as cowberries, bilberries and cranberries can be found. Snow covers reach up to 2 metres here in winter.